TUCSON, Ariz. — Vanderbilt Head Baseball Coach Tim Corbin has been named National Coach of The Year by Collegiate Baseball newspaper. One of the most respected coaches in college baseball, Corbin led the Commodores to their first national baseball championship at the recent College World Series with a 3-2 win over Virginia. Corbin led Vanderbilt to a 51-21 overall record and has now guided the Commodores to 10 NCAA Regionals (eight straight), four Super Regionals and two College World Series appearances. He ranks second on the all-time Commodores’ win list with 516 victories since taking over the program in 2003. Vanderbilt compiled 17 stolen bases in 23 attempts over seven College World Series games. That is tied for the highest stolen base total ever at a College World Series with Oklahoma State in 1955. During the entire NCAA Division I tournament, the Commodores swiped 29 bases in 37 attempts. On the flip side, opponents were only successful in 3 of 6 attempts against Vanderbilt. 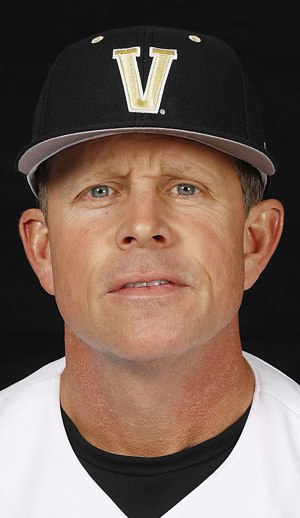 Corbin finished his 12th season at the helm of the Vanderbilt baseball program. He has turned the Commodores into a national power and taken the program to unprecedented success leading Vanderbilt to the College World Series in 2014 and 2011. Beyond his national championship in 2014, he led Vanderbilt to one of its best seasons in school history in 2013. The Commodores matched the school record with a 54-12 mark and smashed the Southeastern Conference record, finishing the conference slate with an amazing 26-3 record. In addition to the on field successes, the baseball program itself has had significant upgrades to the facilities with a new field house, complete with new locker rooms for players, coaches and Commodore alums playing professional baseball. Also included are coach’s offices, a classroom that overlooks Hawkins Field and a new weight room. In 2009, permanent seats in the outfield pushed Hawkins Field seating capacity to double the amount when Corbin arrived in 2003. These upgrades reinforced the excitement and commitment made to the baseball program due to the successes Corbin had achieved. In the latest facility improvement the playing surface at Hawkins Field was replaced during the summer of 2012 with a synthetic surface. The timing of the change to turf was perfect as the Commodores played multiple games in bad weather during the 2013 season. Corbin, along with his coaching staff, are a tireless group that saw their recruiting efforts pay in 2005, 2011 and 2012 as their recruiting classes was labeled the nation’s best. Professional baseball has also taken notice of the program with nine Commodores being selected in the first round since 2003. Before Corbin was hired as the 21st coach in program history, Vanderbilt had not earned a spot in the conference tournament in a decade but made the post-season tournament in 2004. Corbin came to Vanderbilt following nine seasons as an assistant coach at Clemson. During his time there (1994-2002), the Tigers had more victories than all but four programs. Prior to his time at Clemson, Corbin was head coach at Presbyterian College for six seasons beginning in 1988. There he restarted a baseball program that had been dormant for several years. He directed Presbyterian College from NAIA to NCAA Division II status and had a 106-138 overall record. Along the way, the Blue Hose made three consecutive appearances in the South Atlantic playoffs (1991-93), and Corbin earned South Atlantic Coach of the Year honors in 1990. OMAHA, Neb. — Analyzing how national champions have won the College World Series the past three years is a fascinating study. 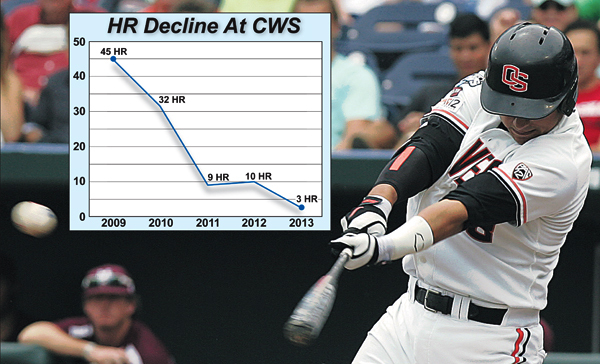 Only three home runs were hit in 14 games at the 2013 College World Series. It marked the lowest home run total since 1966 – some 47 years ago when only two home runs were hit in 15 games. And in the previous two years, only nine were hit over 14 games in 2011 while 10 were belted in 15 games in 2012. Never in College World Series history have you had a 3-year stretch that demanded such incredible pitching to win it all. Collegiate Baseball was intrigued at how the past three national champions have not only rolled through the College World Series with perfect 5-0 records, but each of these teams went 10-0 in Regional, Super Regional and CWS games. UCLA and South Carolina utilized pitching in the traditional sense as they used a great starter, a setup man and a closer. Arizona, out of necessity, had their starters try to finish games. Wildcat pitchers threw eight complete games in their final 19 contests and became the first national champion in 56 years to have every starting pitcher come close to throwing complete games at the CWS. During the entire 2012 NCAA tournament (regional, super regional and CWS games combined – 10 games), Arizona’s three starting pitchers averaged 8.48 innings per start. Collegiate Baseball contacted the three head coaches who led their teams to national championships the last three years in Ray Tanner (South Carolina), Andy Lopez (Arizona) and John Savage (UCLA). First, a little background on the lack of home runs is in order. The biggest reason for the downturn has been the use of mandated BBCOR specification bats starting with the 2011 season. Also a factor has been T.D. Ameritrade Park in downtown Omaha which has been the venue for the CWS since 2011. The park faces southeast, and the outfield is a grave yard for hard hit fly balls that rarely carry over the fence. The facility utilized for the College World Series from 1950-2010 was Omaha’s Rosenblatt Stadium. It was a hitter’s paradise built on a large hill which faced northeast as the wind blew many balls over the fence for home runs. 2007: 37 homers in 15 games. 2008: 38 homers in 16 games. 2009: 45 homers in 15 games. 2010: 32 homers in 16 games. The most home runs ever hit during the College World Series history took place in 1998 as 62 circuit clouts were belted in 14 games by 42 different players. College World Series batting averages have also plummeted as well as runs scored which have been the lowest in 39 years. During the 2011 ’Series, eight teams batted .239 with 101 runs scored (average 3.6 runs per team per game). The 2012 CWS offensive numbers were just as anemic as the batting average was .234 with only 107 runs scored (3.5 runs per team per game). Poor offensive numbers continued in 2013 as the cumulative batting average was .237 with 86 runs being scored (3.1 runs per team per game). The last three years, the cumulative ERAs of competing College World Series teams has been 2.66 (2011), 2.97 (2012) and 2.54 (2013) — the lowest 3-year ERA period going back to 1952 — 61 years ago. To win the national championship the last three years, South Carolina, Arizona and UCLA have had to lean heavily on extraordinary pitching staffs and remarkable defenses. In 2011, South Carolina went 5-0 at the College World Series as they posted a glistening 0.88 ERA. In 2012, Arizona also went 5-0 with a pitching staff that had a 1.12 ERA. Then last year in 2013, UCLA won its first national title in baseball, also going unbeaten at 5-0, as the Bruins posted a microscopic 0.80 team ERA and only allowed four runs. In the 67-year history of the CWS, only one national champion has given up fewer runs with California allowing three in 1957. To read the full story, including in-depth comments by Ray Tanner (South Carolina), Andy Lopez (Arizona) and John Savage (UCLA), purchase the June 13, 2014 issue of Collegiate Baseball by CLICKING HERE. LEXINGTON, Ky. — After one of the most amazing seasons in college baseball history, University of Kentucky junior LHP/1B A.J. 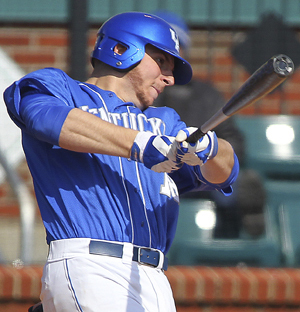 Reed was named Collegiate Baseball’s National Player of The Year. Through the end of the regular season, he had belted 23 home runs to lead the nation and hit more homers than 193 out of 296 teams in NCAA Division I. The lefthanded hitting Reed also hit .351 with 17 doubles and 70 RBI. He was attempting to become the Southeastern Conference’s first triple crown winner since Rafael Palmeiro in 1984 as he led the league in home runs (11 more than the closest player) and RBI (12 more than the next hitter) while ranking third in SEC batting average which was just behind Jordan Ebert of Auburn who was hitting .353 as the regular season concluded. When you consider that Reed was 0-7 against SEC teams last season as a pitcher with a 4.35 ERA in 10 starts, his pitching achievements this year are even more staggering. He posted a 9-1 record in the SEC this season and an 11-2 mark overall with a 2.10 ERA. It could be the greatest SEC turnaround of a pitcher in history. The great disappointment of his sophomore year as a pitcher was tremendous motivation for him to work harder than he ever has to become better. And it started last Fall as he dropped 25 pounds from a 6-foot-4, 260-pound frame. He worked his tail off to get into the best playing weight of his life which translated into unparalleled success for him this season. “I went on a strict nutrition regimen as I cut out a lot of carbs,” said Reed. “I came in every morning and did cardio workouts with our strength coach Monday-Friday. I did that all Fall and Winter and lost about 25 pounds as I slimmed down from 260-235 pounds. “I was in the best shape of my life which allowed me to throw longer in games. Reed said that he also worked extremely hard in the off-season to have a more repeatable delivery. “My goal was to make every pitch feel the same and have the same release point for all my pitches so they would be more difficult to hit for batters. Then every pitch out of my hand would look the same to them since I wasn’t releasing one pitch different than another. “Two other important ingredients were keeping pitches down and working off my fastball. Also throwing three pitches consistently for strikes was a big change from last season when I was 0-7 in the SEC. Reed has five different pitches, including a 4-seam and 2-seam fastball, changeup, curve and cutter. He utilizes his 4-seam fastball more than the 2-seamer as he routinely fires it between 88-92 mph. His 4-seam fastball has enough run on it to be effective against hitters. To read more about Kentucky’s A.J. Reed and how he put together one of the best seasons in college baseball history, purchase the June 13, 2014 issue by CLICKING HERE.